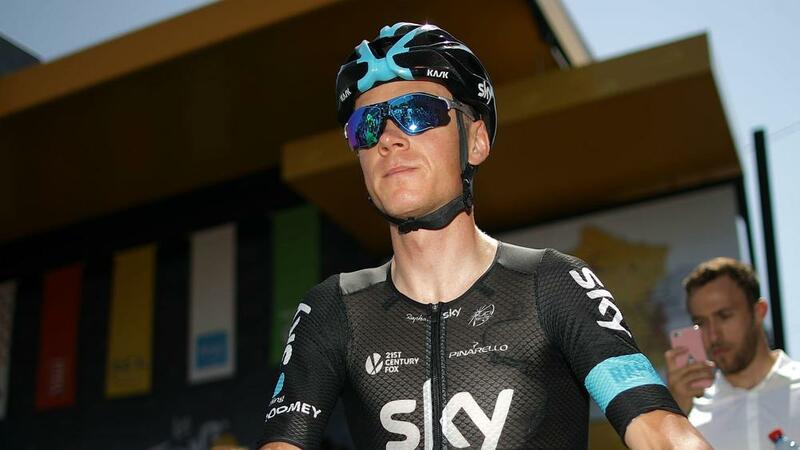 Chris Froome produced a sensational attack following the final climb of stage eight of the Tour de France to take over as leader of the general classification. The Team Sky rider and defending champion mounted a sensational descent of Col de Peyresourde to leave his rivals in his wake, the Briton moving 16 seconds clear at the top courtesy of a time-bonus boost. Rivals Nairo Quintana (Movistar) and Alberto Contador (Tinkoff) tried to stay with Froome on the climb, the latter fading badly, and once over the summit the Colombian could not catch up. Adam Yates (Orica-BikeExchange) leads the chase to the yellow jersey with Joaquim Rodriguez (Katusha) and Dan Martin (Etixx - Quick Step) just behind him, while Froome's expected GC rivals Quintana and Fabio Aru (Astana) are 23 seconds back. The 184 kilometres from Pau to Bagneres-de-Luchon lived up to its billing of a Pyrenean classic as attacks began right from the off, although the peloton had to recover from a crash in the neutral before the start. Various riders made an early move, but it was Julian Alaphilippe (Etixx), Thibaut Pinot (FDJ) and Rafal Majka (Tinkoff) who made one stick, the trio opening up an advantage of a couple of minutes. Martin soon bridged the gap, before Alaphilippe was dropped five kilometres short of the Col du Tourmalet's peak, the iconic Tour climb proving too much for the Frenchman. It was Pinot who crossed the summit first and when he did the same on the Hourquette d'Ancizan he held the virtual King of the Mountains lead. However, it was Majka who finished the day in the polka-dot jersey after he reached the top of Col de Val Louron-Azet in third place – the six points enough to move him one point clear of Pinot. Froome attacked with 17km to go, but it was not until he started to head downhill that he began to lose the lead group, coming home 13 seconds clear with an average speed of 62.5km/h to give him the overall lead. Greg Van Avermaet's time in yellow came to an end in the Andorran mountains as he finished well down, while Katusha's Michael Morkov became the first rider to abandon.